One of the feature of Calques 3D is the possibility to create a geometrical figure and to save it as a macro-construction, i.e. as a single object whose intermediary elements will still be available for manipulation (we call them composite object). This in turn will allow you to build up a library of new figures that could be used for further constructions. 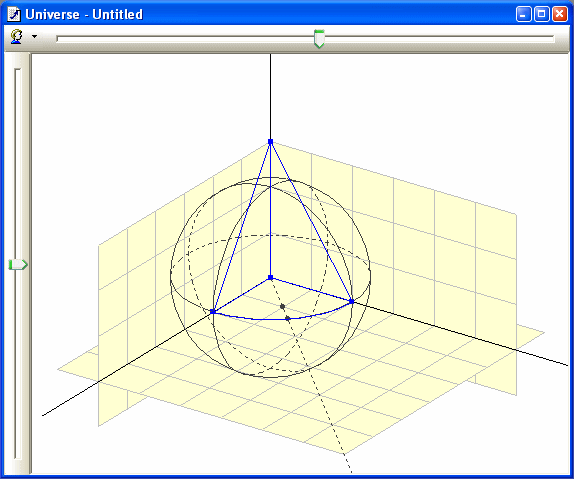 Calques 3D also provides you with a very easy and intuitive way to configure the interface, mostly by dragging and dropping elements such as menu commands, toolbars, etc. across the interface. Let's start by constructing a quarter of a cone that will be used for the corner of the volume. 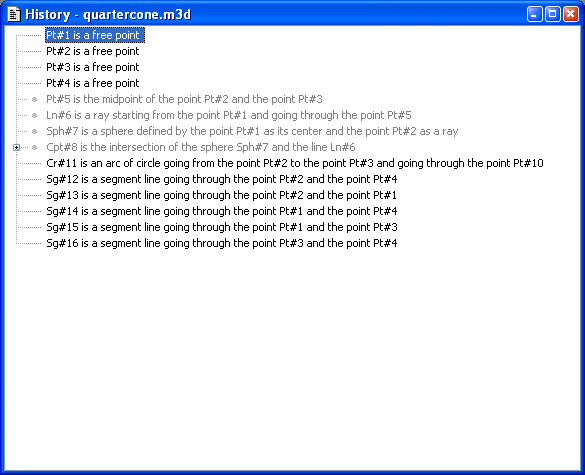 Once done, save the current figure as a macro-construction by using the Macros | Save as a macro ... command. Fill in the various attributes used to identify the new object: its name, its tooltip help and its complete definition. Note that in both help and definition, the %s symbol can be used to indicate the placeholder for the name of the object, once included in a construction. 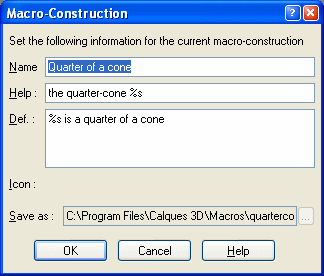 Select a file and a location for saving the macro-construction (macro-construction files are identified by the *.m3d extension).